Following the success of last year’s Google Model Your Town competition, today we're launching the second Google Model Your Town Competition. Model Your Town is about geo-modeling – making photo-textured models of real-life buildings that appear in Google Earth. The Model Your Town Competition is also a chance to celebrate your town by adding it to the 3D map. Of course, the USD$25,000 for a local school/district is a nice incentive too. The Model Your Town Competition is open to just about everyone, just about everywhere in the world. Form a team, model buildings (using SketchUp or Building Maker) and upload them by the end of February 2012. You can model as many structures as you like – which types of buildings you choose to include is entirely up to you. The important thing is that your choices say something about the character and history of your town. If your town wins, a bunch of us from the SketchUp team will visit, throw you a dinner party and do our best to make you feel like the local hero that you truly are. Check out the competition website for details, and start rounding up teammates! New to geo-modeling? 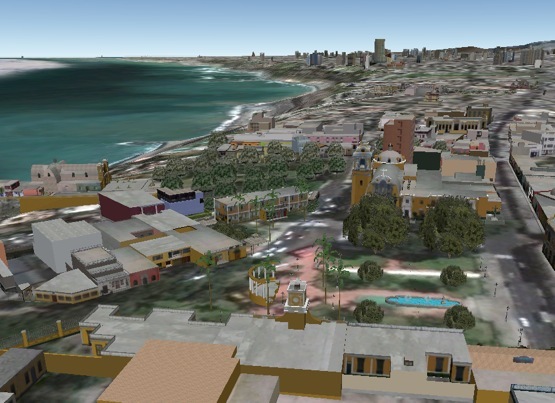 Learn more at Your World in 3D, then get started modeling your town!